This post has been sponsored by The Coca Cola Company. All thoughts and opinions are my own. 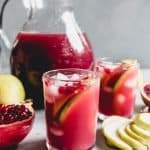 Pomegranate in a Pear Tree Punch is a fun, festive, and non-alcoholic holiday drink that is quick and easy to make and perfect for any Christmas party or other holiday gathering! When we entertain, I usually like to have a tasty beverage to serve. 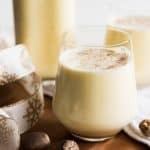 During the winter, that’s often something like homemade eggnog, white hot chocolate, or rich European-style hot chocolate. 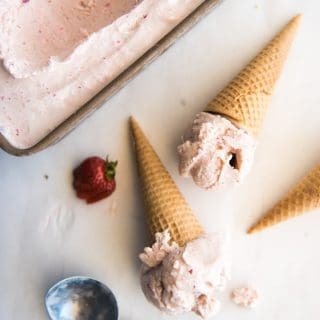 But we are still having lots of warm days here, so even though my mind says “holidays!” and “cozy!“, I find I am wanting something chilled, light and refreshing. I was at Safeway the other day and noticed an end cap with all these new DASANI® Sparkling water flavors that sounded so good. 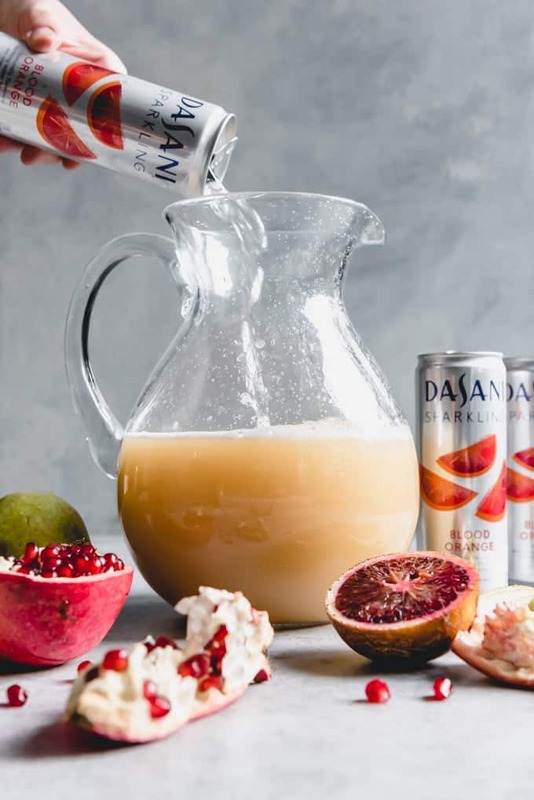 I was inspired by the DASANI® Sparkling Blood Orange flavor which caught my eye and decided to bring some home to create a fun, fruity holiday beverage that my whole family could enjoy. 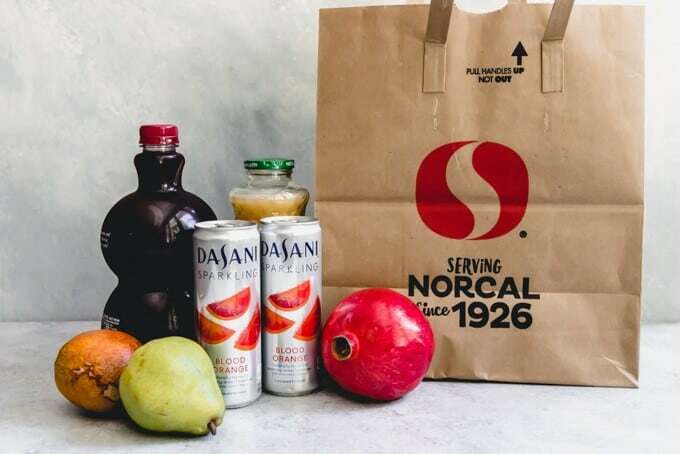 Each delicious DASANI® Sparkling flavor like black cherry, blood orange, lime and more are unsweetened with no artificial flavors and zero calories. Visit your local Safeway store to find your favorite! 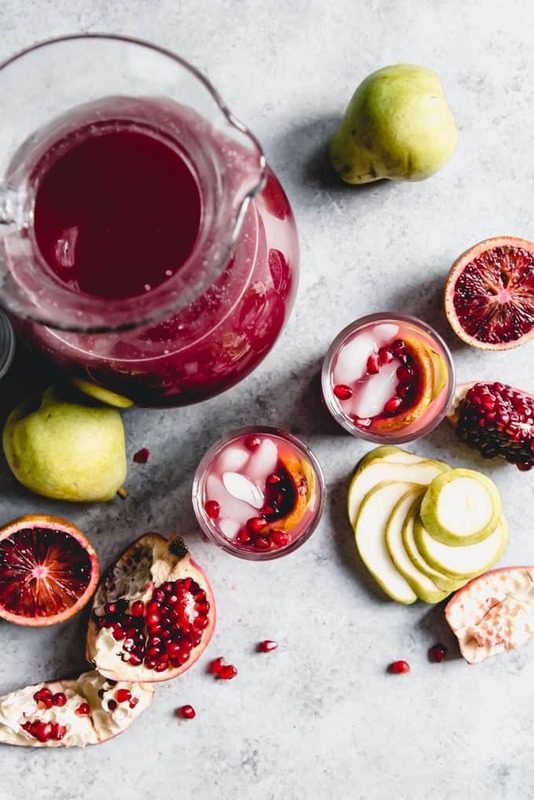 What I came up with is this easy fruit punch that is still seasonally appropriate, made with the flavors of three fruits that all come into season in winter. Pears, pomegranates, and blood oranges (all citrus, actually, not just blood oranges) have their moment to shine during the winter months, so I thought it would be fun to name this fruity non-alcoholic punch concoction with a nod to the “12 Days of Christmas” song by calling it Pomegranate in a Pear Tree Punch. See what I did there? I grabbed a few blood oranges, pears, and pomegranates while I was at Safeway to garnish each glass and give a hint at the flavors in the drink. Plus, they just look so beautiful and festive with their seasonally appropriate colors! 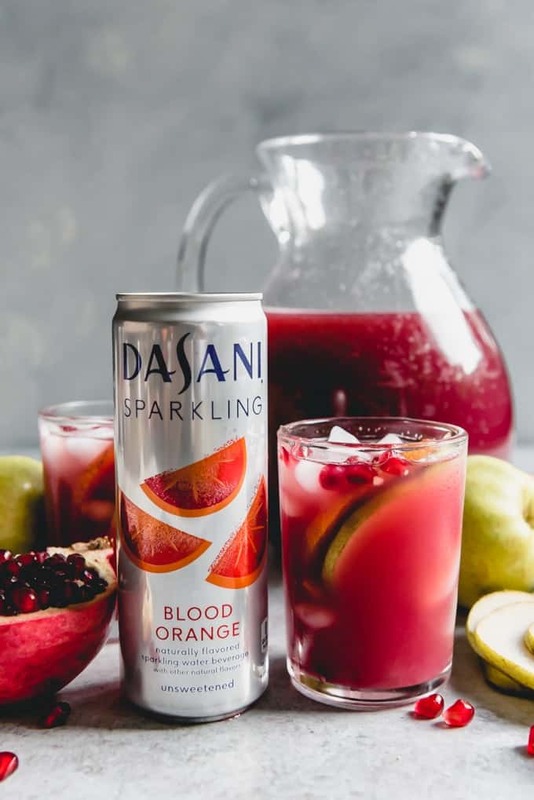 I love how the DASANI® Sparkling Blood Orange gives just a little bit of zing to the punch. You could play around and try any of the other DASANI® Sparkling flavors with this, though. I’m thinking that the DASANI® Sparkling Lime or DASANI® Sparkling Black Cherry would both be delicious here as well. 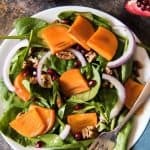 This would be perfect with Thanksgiving dinner or served on New Year’s Eve, especially for those of us who don’t drink alcohol but want something festive and special to toast with. 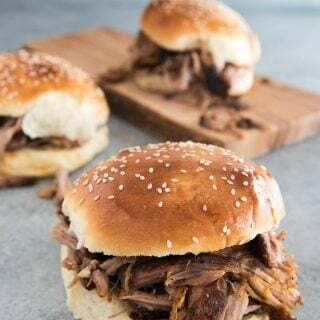 But it’s so easy that you can also easily just enjoy it with family dinner anytime during the season! 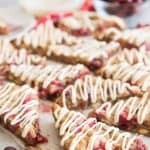 What is the easiest way to cut a pomegranate? If you don’t know how to peel a pomegranate, it’s not nearly as difficult, intimidating, or messy as you might think. I think the easiest way to cut a pomegranate open and get the seeds, or arils, out is using the following technique. Cut off the top. This is pretty much just like hulling a strawberry. Every pomegranate has one flower end that sticks up. You can just use a paring knife to cut it at an angle, removing a little cone of pith along with the flower without cutting any of the juicy seeds. Score the sides. If you really look at a pomegranate, it’s not perfectly spherical. There are ribs all around it, usually 4 to 6 of them, that create natural segments inside the fruit. You can identify them from the outside just by studying the fruit to notice that there are flat-ish sides interrupted by raised subtle bumps or ridges on each pomegranate. Use the paring knife to score along the rib from top (where you just removed the flower) to bottom, cutting through the red rind and partway through the pith. 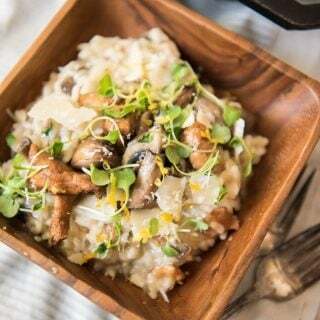 As long as you stay on the ridge itself, you will pretty much entirely avoid cutting into any seeds and thereby avoid creating a juicy mess. Break open the pomegranate. Once the ribs of the pomegranate are scored, it’s easy to open up the pomegranate just like segmenting an orange. Use your thumbs and fingers to gently but firmly pull the pomegranate apart along the lines scored into the rind, and the fruit should come apart. Getting that first segment is the hardest, I’ve found, but once you’ve got it, it’s easy to pull apart the rest of the pomegranate. Remove seeds and eat! At this point, you can give your kids segments of pomegranate and let them use their tiny fingers to pick out each seed one by one. It buys me a good 10 minutes of their quiet concentration and is good for developing fine motor skills in children! 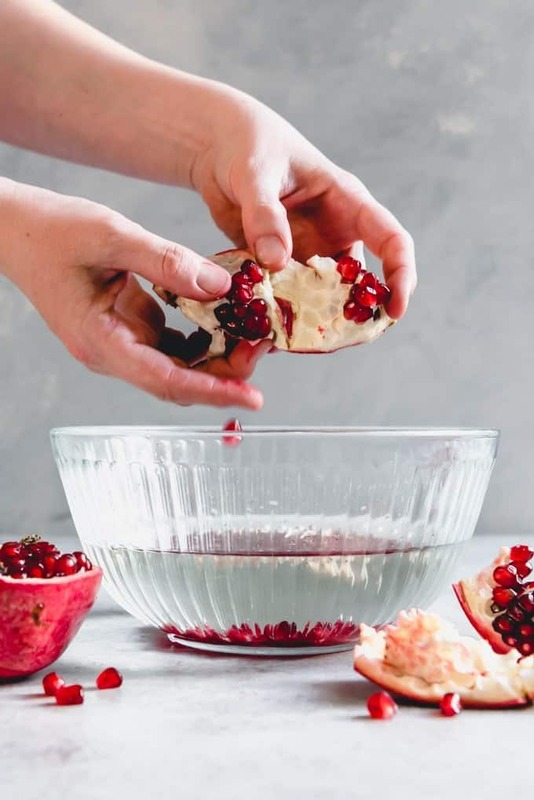 Or you can pop the seeds out over a bowl of water as shown in this image to remove all of the ruby-colored pomegranate arils in one go if you like to eat the sweet, juicy fruit by the spoonful or use it in recipes. Any white pith will float to the top of the bowl while the seeds will sink to the bottom, then it’s easy to separate the two. Some people whack the back of each section with a spoon to knock the seeds out, but I find it easiest to just work with my hands and can de-seed an entire pomegranate like this in about 3 minutes. Then you can eat the juicy, sweet-tart fruit out of hand (my kids love having segments of pomegranate and picking the seeds out one by one) or completely de-seed it for use in drinks like this Pomegranate in a Pear Tree Punch; salads like this Winter Pear, Pomegranate & Swiss Salad with Poppy Seed Dressing or Persimmon, Pomegranate and Spinach Salad, or other recipes. The only real prep you need to do to make this easy holiday drink is to chill all the ingredients in advance so they are cold when you combine them. I use a pretty glass pitcher, but a punch bowl would work well also. 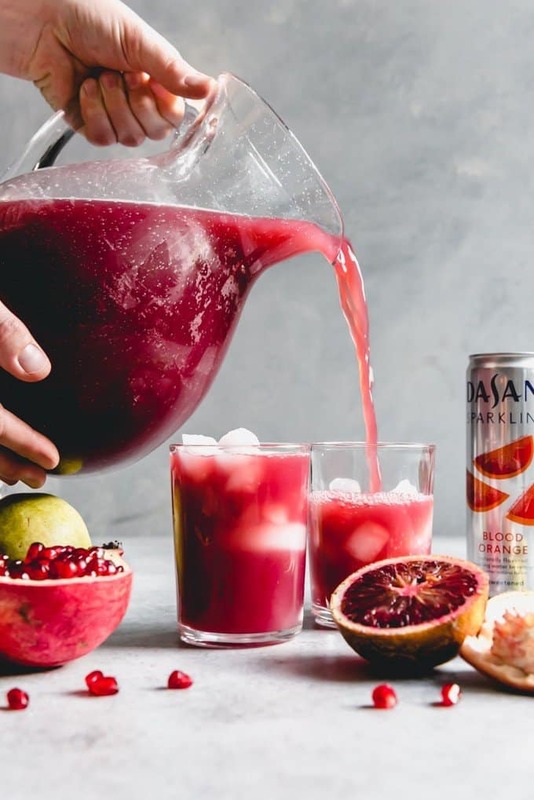 Just pour the pear juice, DASANI® Sparkling Blood Orange, and pomegranate juice together in the pitcher or bowl and stir to combine, then keep cold until ready to serve. 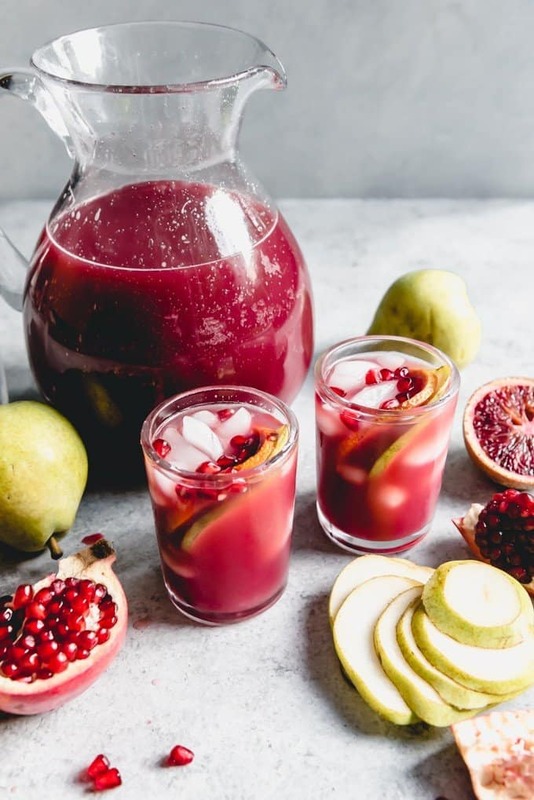 You could add slices of pear or blood orange to the pitcher of Pomegranate in a Pear Tree Punch for presentation, although any pomegranate arils will just sink to the bottom. So my preference is to fill each glass with ice and add a slice of blood orange and pear to it, then sprinkle the pomegranate arils over the top after filling with the punch. That way the pomegranate seeds can rest on top of the larger slices of fruit or ice without floating down to the bottom, and you get the best presentation. 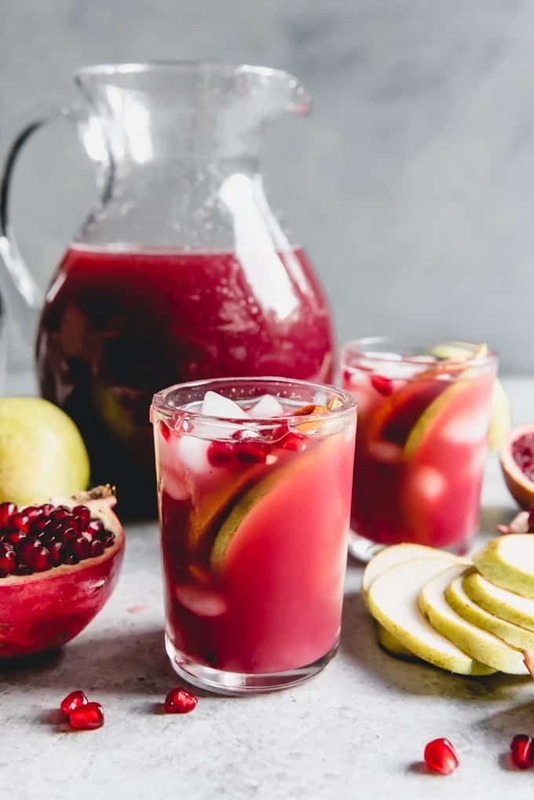 Pomegranate in a Pear Tree Punch is a fun, festive non-alcoholic holiday drink that is quick and easy to make and perfect for any Christmas party or other holiday gathering! Refrigerate all juices and DASANI® Sparkling Blood Orange until cold. 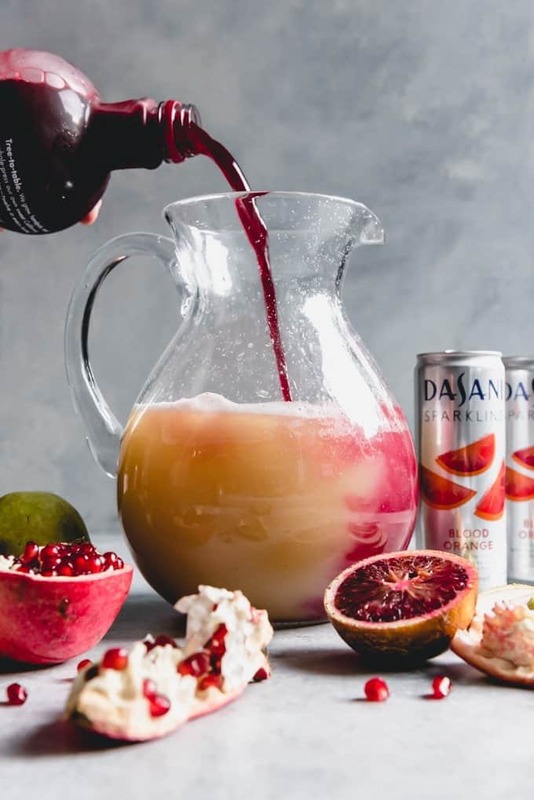 In a large pitcher or punch bowl, combine the juices and DASANI® Sparkling Blood Orange, then stir well and serve immediately in ice-filled glasses. Garnish with the sliced pear, blood orange, and pomegranate seeds, if desired. Pear nectar also works if pear juice is unavailable. These are at the top of my to drink list this holiday season!! I can’t think f a better way to toast to the season. Thanks for the great recipe!